The problem arises. You grab your toolbelt. You put on your safety goggles. You even throw on a hard hat to look the part. Your dark washed jeans pour over the tops of your construction boots as they pound down the stairs towards your circuit box. You open the door and realize immediately that you have no idea what you are doing. We all hate to admit it, but sometimes it’s just best to have a pro come in to help. There’s no shame in getting a professional assessment. If anything is smoking, flickering or buzzing- make the call. These are indicators that you have more than elementary problems with your electrical system. It could mean replacing individual breakers, or it could mean replacing an entire panel. But when you get to that point, you need to call in some backup. If you keep adding more and more power strips to your outlets, you need more outlets. The answer isn’t stuffing more power strips in your home and plugging more devices in. Older homes weren’t ready for today’s power needs. You need a professional to install more receptacles and circuits to accommodate your consumption needs. If your outlets or switches are warm to the touch, you need a visit. 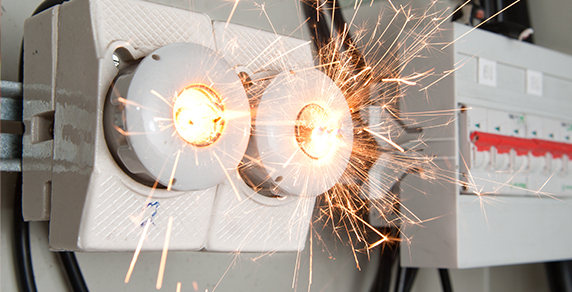 This could be from a variety of factors, but heat is never good when it comes to electricity and your outlets. Another thing to look for is discoloration on your plates. As logic would indicate, those streaks of black and brown could literally mean that your plastic is being cooked by heat from faulty electrical systems. Get it checked. If your lights flicker, get some help. You might need to put some of your appliances onto a single circuit or separate line. If your lights flicker every time the dryer hits a new cycle that’s not normal. Have a pro come out and determine your next steps. If your home is 25 years or older, it’s time to have it looked at. You don’t always have to wait for an issue to call an electrician. Be proactive. Older homes naturally need maintenance and that applies to the electrical system as well. Just like you’ll invest in new plumbing and exterior modifications, it might be time to modify the electrical from dangerous and antiquated wiring to more modern systems. Picking the right electrician can be a tough choice, so now that you know you need to bring one in, check out our tips on hiring the right person for the job! No matter the reason you’re calling, Blue Collar Electricians is always glad to earn your business. Whether you just want us to troubleshoot your system before a problem arises or you have an issue that needs to be addressed immediately, our team is ready to help! 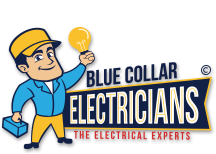 Contact Blue Collar Electricians today for all of your Northeast Ohio electrical home repairs.